Sherlock Holmes and Dr John Watson embark on their first mission together as they investigate a mysterious series of suicides. 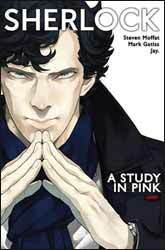 This graphic novel adapts A Study in Pink, the first episode of the smash-hit BBC / Hartswood Films TV show starring Benedict Cumberbatch as Sherlock and Martin Freeman as John. Together they tackle brain-teasing crimes in modern-day London in this stunning manga, which is presented in its original right-to-left reading order, and in the full chapters as originally serialised. Meet Holmes and Watson for the first time… all over again…! As an English translation of a 2012 Japanese comic book adaptation of a 2010 television reimagining of a Victorian novel, there was a danger that this new edition of A Study in Pink might end up being too far removed from its source material. Is it an adaptation too far? In fact, this feels more like a homecoming for Holmes, as the adventure returns to its native language – in so doing driving home just how closely the artist Jay. has adhered to the scripts of Steven Moffat and Mark Gatiss. Occasionally the sequence of events differs from the way in which they unfolded on screen (for example, the graphic novel opens with the first three apparent suicides and the press conferences regarding them, rather than our introduction to John Watson, which takes place later in the opening chapter), but essentially this book tells the whole story in full detail. Lines such as Sherlock’s salacious comments about Sergeant Donovan’s unusual deodorant and the state of her knees come across just as well in print as they did on screen. Elsewhere, John is aghast that his colleague is having so much fun. “There’s a woman lying dead,” he reminds him. “Perfectly sound analysis,” remarks Sherlock, “but I was hoping you’d go deeper.” However, the hilarity over Sherlock’s improvised salutation, “Welcome to London”, after he and John challenge the wrong suspect in the back of a taxi, doesn’t really work on the page. And perhaps the most famous line in the entire story – “I’m not a psychopath, Anderson. I’m a high functioning sociopath. Do your research” – is rather spoiled by the fact that, in psychiatric terms, Sherlock isn’t either of those things. On this occasion, it’s Steven Moffat who should have done his research. In contrast to the comic-book adaptations of screen works that we tend to get in the West, which seldom exceed 64 pages, this volume boasts just under 200 pages of strip (with sketches and cover variants from the individual monthly issues interspersed between the chapters and at the back of the book). This allows time to include every line of dialogue from the television script, as well as moments of quiet reflection, especially from the baffled and traumatised John. Regular visitors to this site may have read my comments about Titan’s Doctor Who: The Fourth Doctor mini-series, which I criticised for being too slow-moving and lacking in action. There is no contradiction here. When a comic is 22 pages, as Western comic books usually are, the story needs to develop quickly, otherwise nothing much will have happened by the time the issue is over. But when a serialisation averages around 32 pages per issue, as this one does, you can afford to pause for a moment as John gazes sadly at his walking stick or at the empty page of his blog (the point of that scene is, after all, that nothing ever happens to him) or as Sherlock slowly cracks a smile. The likenesses of Benedict Cumberbatch and Martin Freeman have been ‘manga-ised’, but remain immediately recognisable, as does Mark Gatiss as the mysterious ‘M’. There’s a hint of John Steed about the latter character, as we first see this decidedly dapper figure leaning casually on an umbrella. On the other hand, Detective Inspector Lestrade is sometimes hard to distinguish from John, while Mrs Hudson doesn’t look much like Una Stubbs – but is nevertheless unmistakable due to her personality and position. There is some confusion towards the end of the tale, as a photograph that turns out to show the villain’s children looks rather like an image of Moriarty and Molly (it did to me, anyway). Occasionally the visual sense of certain events is hard to follow, such as a shot of an interior telephone while a call box on the street is ringing. The artwork is presented in its original black and white, and reads from right to left. That can be disconcerting at first if you have never read manga before, but you soon get used to it. In fact, I think Titan could have gone one step further and presented the order of the pages from back to front in the Japanese style. There are a few occasions where an image extends across a double-page spread (such as when we see the fourth victim reaching for some pills, or when we first behold the living room of 221-B Baker Street) and, because this edition reads from front to back, those images get split into two. The speech bubbles are quite an unusual shape for containing English dialogue, which is an inevitable result of translating from Japanese. The sound effects (“Blam”, “Whack!”, “Scribble scribble”, etc) are part of the art, so the English words for these tend to appear in the spaces beneath the frames. Sometimes these sounds seem superfluous to our understanding of what is going on visually, and it can become irritating to read the likes of “Turn”, “Twitch”, “Grip” “Startle”, “Stare” and “Smile” (yes, I can see that he’s smiling, thank you), but this is more a criticism of the original manga than the English translation. Despite some awkwardness in translating the visual tics of a television show into the visual tics of a comic, and in translating the textual tics of Japanese manga into English, this is a compelling version of A Study in Pink. It is all the more engaging now that it can be read in compilation form, without having to wait a month between instalments. Smile!